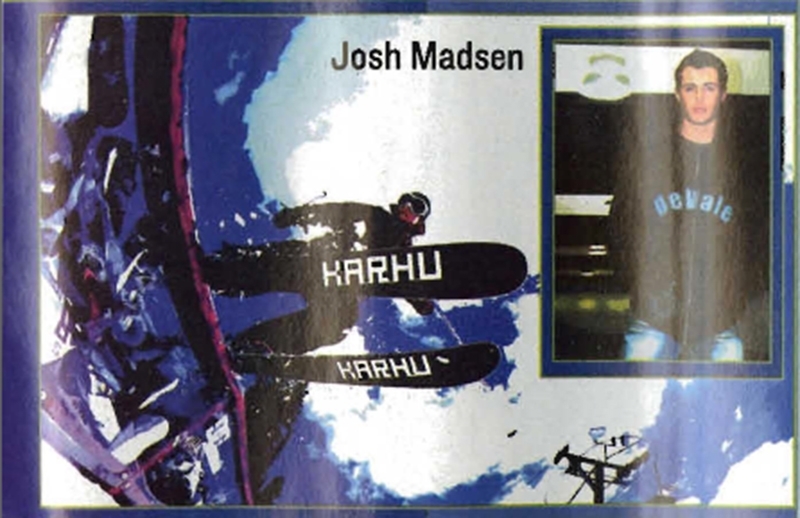 Josh Madsen is a 26-year-old Pro Telemark Skier. He has been living in Utah for more than 10 years and has been telemark skiing for 12 years. Recently, in-between a filming trip to Austria with the Line Ski Team and a road trip to British Columbia with friends to go heli skiing, I had the chance to spend two days at Brighton Ski Resort riding with Josh, talking about telemark history and culture while being blown away watching what he proves is capable with free heel skis. Leaving out the late night party details and chilling in the trees, here is a brief run down of our encounter. The word “ski” is a Norwegian word which comes from the Old Norse word “skid,” a split length of wood or “a piece of wood of the most seasoned part of the trunk.” The invention of the skis can be traced back to 4000-2500 B.C. in northern Scandinavia, between Lake Onega and the White Sea. In Norway alone they have been skiing for more than 4,000 years. Skis were initially invented as locomotion between villages and to meet for festivals. The bindings had to be mobile but strong to cross the large snowfields of the continent. In the middle of the 19th century, a carpenter by the name of Sondres Norheim who lived in the region of Telemark, Norway began to develop various ways of stopping and changing directions by using a single piece of wood. In 1868 he impressed and surprised the audience and his competitors when he participated in the first national skiing competition in Norway, held in the capital Christiania (now Oslo). People in Christiania had heard about this extraordinary skier, and Sondre turned out to be the legend. At Iversløkken, Sondres demonstrated – for the first time outside Telemark – the Telemark turn, called the Christiana turn since 1901. Sondres was using heel bindings, and he had shorter skis with curved sides. Other participants used the common toe bindings. The 42-year-old Sondre won with brilliance. Newspapers reported, “It was the winner of the 1st prize who excelled over all the other competitors. He had such a remarkable style of skiing that one would think he had been born to it, and that it was his natural way of moving around.” The performance at Iversløkken was a major breakthrough for Sondres and the new style of skiing. This middle-aged man, the poor cotter from the countryside, demonstrating for everyone what an innovative representing something totally new, overwhelmed people. Sondre has been credited for having invented the curved skis, the bindings with stiff heel bands made of willow, the Telemark turn and the Christiania turn. This is why he has been called the Father of Modern Skiing. “Modern” is referring to the use of skis as a recreation activity and in sports. During the late 19th century, skiing changed from a method of transportation into a sports activity. The competition held at Iversløkken, Christiania in 1868 is regarded as a turning point and the beginning of a new era—it was a breakthrough for skiing as a sport in the capital of Norway, and a breakthrough that had an international effect. With this new development came the possibility to face the mountains, which ultimately lead to the development from cross-country skis to downhill skis and ultimately the alpine skis. The Telemark ski disappeared from the Alps and the limelight returned to Norway, where it remained popular. A small group of Americans resurrected the telemark ski because of its versatility between long cross-country, alpine downhill and ski jumping. Telemark skiing is the grandfather of what skiing has become. The first turns were used bending the knees like the Telemark Turn, which gave birth to the alpine ski, which in turn would influence the birth of snowboarding. When Telemark Skiing was first invented it was never expected to become a global sport. This lost art of Telemark skiing was revived by some pioneers of skiing in Crested Butte, CO in the early 70s by looking at pictures of the old technology and adapting their alpine skis to become free heeled skis. 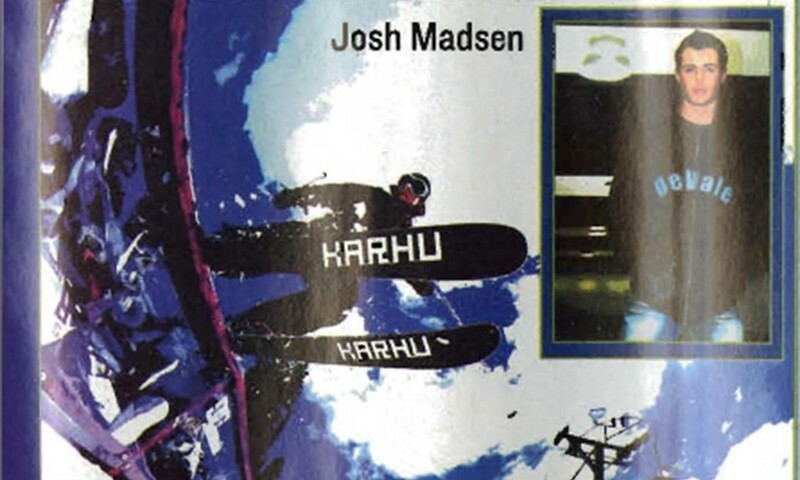 One of the followers of such pioneers, Josh Madsen, grew up skiing in Vail, CO and tried snowboarding for a few years before finding out about Telemarking. At the age of 14, while in a local library, Josh read about Telemark skiing and had seen a few of those men out hiking and skiing with controlled knee-bending turns. The similarities at the time between snowboarding and Telemarking were numerous. Telemarking had a re-birth in the 70’s while snowboarding was in the infant stages of becoming a new sport. Each sport has subsequently been banned from resorts because it rivaled the Alpine skier for mountain space, traffic and control. A technical malfunction was the stereotypical reason for the prejudice that denied each sport on the lifts although injuries have been attributed to all sports and all equipment that has ever been on a mountain. Josh gets hooked up from Karhu, Nike ACG, Scarpa, Devale, Voile, Smith and Park City Mountain Resort.